Announcement Camera bags and straps for everyday outings or international travel! Our comfortable crossbody scarf camera straps and our Camera Coats are the perfect photographer gift! Camera Coats are the perfect camera travel bags for Disneyland, backpacking Europe, or everyday adventures! Now you can throw your camera in your purse, backpack or carry-on bag without worry. Camera bags and straps for everyday outings or international travel! 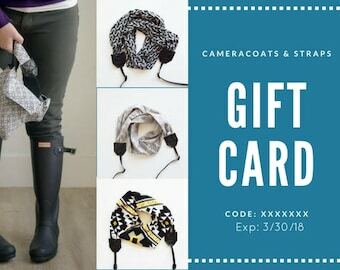 Our comfortable crossbody scarf camera straps and our Camera Coats are the perfect photographer gift! Mens and Womens Camera Bags Travel DSLR Canon Nikon 2018 | Black Soft Leatherette Padded Fitted Camera Cover | Top Holiday Gift! Just perfect! Snaps on your camera strap, so when you are using your camera, no worries of losing it. Outside pockets fit the lens cap, so you don't lay it down. I dislike the hanging caps, so this is perfect. No bulkier than my camera, yet protects. So pleased with my purchase. I found that when packing my camera, the strap folds and fits within the cover. Love, love, love it. I love the camera bag! Fits my DSLR perfectly and is of good quality. I gave it a 4 because the strap it comes with is a like plastic material and was missing a clip so it was not as I expected; the pictures look like its made of cloth so it does not seem very comfy to wear for long periods of time. The strap does come free with the bag so not the reason I bought it but very happy with the bag! The family behind the business. I couldn't do it with these men in my life! My friends wanted one. And thus, began my journey with Camera Coats. I hope you love them as much as I do! It was life changing I tell you. It was protected and it didn't have to haul another bag around! I kept that little cover on my camera (wearing it around my neck) as we went to the beach, Disneyland, and everywhere else. I was in love. My little "coat" protected my camera from the bumps of crowds, kids spills, sun, rain, snow, sand, and anything else that came my way. My friends wanted one. And thus, began our journey with Camera Coats. I hope you find a coat you love too! We ship USPS within one business day of purchase. Please contact us with any questions, anytime!